NEW DORP BEACH — A development plan aims to turn the Hylan Plaza shopping center in New Dorp Beach into a "downtown hub" with shops and outdoor dining. Kimco Realty, owners of the plaza, will develop "The Boulevard" on Ebbits Street and Hylan Boulevard, adding nine new buildings to the plaza and keeping two existing ones, according to the site plan posted online. "Without a doubt, Staten Island is in the midst of a renaissance," the plan reads. "Retailers are flocking to the under-served Staten Island market for its combination of strong population density, high income levels and projected growth. Soon they'll be flocking to 'The Boulevard.'" A spokesman for the realty agent said the project was still in the conceptualization phase and couldn't say when construction is expected to start. He also could not say what existing stores or store fronts would stay during the change. 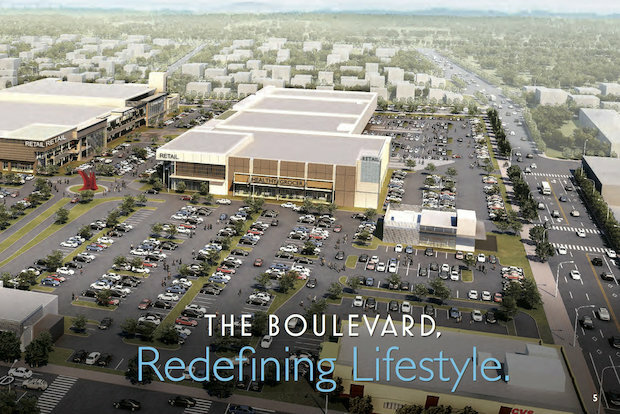 According to the plan, "The Boulevard" will have ground level retail stores fronting a "Main Street Plaza" that has a sidewalk and outdoor dining. The second level of the buildings will house larger anchor stores and entertainment options. Currently, Hylan Plaza has around 32 stores including Kmart, CVS and Toys R Us. Staten Island has had a recent boom in new, large-scale developments, mostly focused on the North Shore. These include the upcoming New York Wheel and Empire Outlets near the St. George Ferry Terminal. While "The Boulevard" is nearly a 20 minute drive from the North Shore, developers said its central location could turn it into the borough's "premiere downtown hub."